WEG technology contributes to the production of sustainable fuel in Europe. The first W22 high efficiency motors supplied by WEG in Europe - 3 off 200kW machines - are (appropriately) engaged in a 'green' process for the production of sustainable bio-fuels. The 4-pole 315L frame W22 motors have been supplied to BioWanze in Belgium. They are used with inverters in a mill that processes wheat and beet syrup to produce bio-ethanol. With this innovative system, BioWanze intends eventually to provide half the amount of the bio-fuel consumed in Belgium. BioWanze is the first project to produce new generation, bio-ethanol in Europe. Begun in 2009, the plant, at Wanze in Belgium, is capable of producing 758m3 of ethanol per day. Bio-ethanol is produced from agricultural feedstock - in this case, wheat and beet syrup. The process is highly efficient - the centrepiece being a biomass boiler with enhanced thermal efficiency - with each element of the process optimised to ensure an overall minimal impact on the environment. 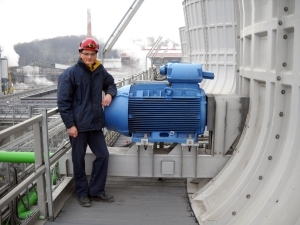 The requirement for maximised efficiency across the process has resulted in the use of WEG's new W22 high efficiency motors at the BioWanze facility. 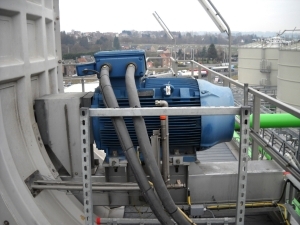 The motors are installed on the cooling tower of the mill at the plant. 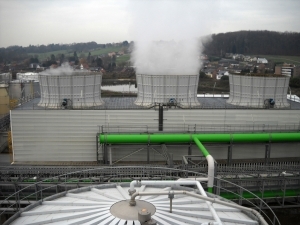 They were supplied by WEG's Benelux, branch in Belgium, to Hamon Thermal Europe, a cooling tower manufacturer, and subcontractors to De Smet Engineering and Contractors, partners of BioWanze in the mill construction project. 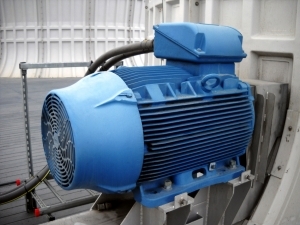 The W22 line is a new generation of high efficiency motors; it excels in energy performance due to its ability to reduce motor losses by between 10 per cent and 40 per cent when compared to traditional AC induction motors. Moreover, the W22 units complement their excellent energy efficiency with low levels of noise and vibration in operation. The W22 motors offer the key advantage that they already comply with and (in some cases) exceed all the requirements of IEC60034-30, the new harmonised IE (International Efficiency) grading standard for electric motors, which will be standard worldwide from June 2011. The design that enables them to achieve conformity includes an aerodynamic frame, which increases the air flow and reduces temperature. In addition, the terminal box of the motor is positioned to improve air flow over the motor. In practical terms this means less hot-spots and, consequently, improved reliability. The reliability and operating life of W22 motors is also extended by WEG's innovative WSeal system. This has a W-ring with a metal cover, which protects the rubber sealing from harmful ultra-violet rays. The same design also ensures that the interior of the motor benefits from much higher levels of protection against the input of external agents, such as water and dust, which may cause damage to rolling bearings within the motor. BioWanze is the result of an investment of more than EUR250 million; it is owned by CropEnergies, a subsidiary of the Südzucker Group, and one of the main European producers of ethanol. The innovative BioWanze production process uses wheat syrup as fuel for the biomass boiler. This reduces the emission of carbon dioxide by 70 per cent when compared to fossil fuels. The biomass boiler is 35-metres high, 60-metres long and 20-metres wide, and is capable of producing 100 tons/hour of steam at 93bar and 520°C.